Digital Learning Day is on February 5th! Help us make a difference in the future of education by joining us this February 5th for Digital Learning Day! In today’s interconnected world, the way students learn is increasingly reliant on digital technologies. This doesn’t just mean having the newest resources and gadgets, it means fully integrating digital learning throughout the entire educational experience. In order to fully prepare students for success in college and a career, schools and libraries everywhere need to embrace digital learning. We can’t prepare every child for the digital future without your support. Help us build the wave of innovation this February 5th by ensuring every child has the opportunity to learn in an innovative, digital environment. Project Tomorrow will be celebrating Digital Learning Day by releasing the Speak Up 2013 survey data on February 5th! 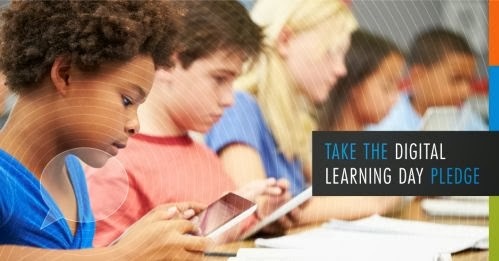 How will YOU celebrate Digital Learning Day? Let us know in the comments section, and check out what others are doing here! This entry was posted in Digital Learning Day on January 23, 2014 by project_tomorrow.